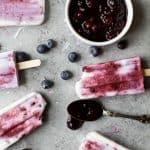 Your summer just got tastier with this creamy dreamy Paleo Blueberry Coconut Popsicles. Made from all fresh ingredients, no dairy, no refined sugar and 100% yum! In a small sauce pan add blueberries, 1 tablespoon of honey, and 1 1/2 tablespoons of water. Bring a boil, stirring throughout. )about 4-5 minutes. Add arrowroot to the blueberries, gently stir everything together. Remove from heat and place in the freezer to cool down. In the meantime, add coconut milk (just cream part) and full can of coconut milk with water to a medium bowl. Add 2 tablespoons of honey, and vanilla extract. Whisk until smooth and creamy. To a popsicle mold, fill each mold up halfway. Add a scoop (about a tablespoon) of the blueberry mixture to each mold. Finish with the coconut milk until the molds are full. Add popsicles stick and place in freezer fro 2-4 hours.